Source: United Nations Country at a Glance. The Republic of Armenia faced several problems after gaining its independence from the Soviet Union. The energy crisis in the 1990s determined its future in many ways. One of its negative effects was the acceleration of the deforestation rate. 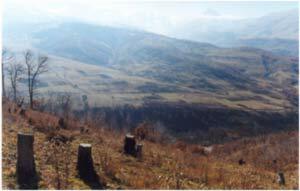 This situation caused deforestation to become one of the main environmental problems in Armenia. Today, deforestation continues being considered a very serious ecological threat. According to the Armenia Tree Project, over 750,000 cubic meters of forest coverage are now being cut annually. 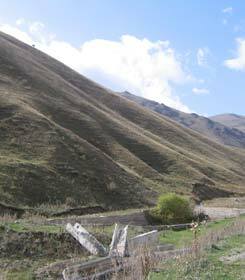 At the current deforestation rate, Armenia faces the probability of turning into a barren desert within 50 years. The environmental consequences of deforestation are already causing many problems and they will get worse if measures are not taken to reduce the current deforestation rate. Land erosion and landslides will multiply and the soil will lose all of its agricultural properties. (ATP) The Armenian people have depended on the forests to endure the energy crisis. Now they need to develop and use alternative energy sources, to protect and preserve their forests. In January 1991, the Armenian Supreme Soviet decided not to participate in President Gorbachev's planned referendum on preserving the Soviet Union. Instead, they would hold their own referendum (in compliance with the procedure outlined in the Soviet Constitution for a Soviet Republic to secede). In August 1991, when the attempt to overthrow President Gorbachev took place in Moscow, the Armenian armed forces were mobilized. The Moscow coup convinced Armenians that it was time to separate from the Soviet Union. On September 21, 1991 the people of Soviet Armenia organized a referendum to secede from the Soviet Union and declare independence. The referendum had a participation of 94% and was approved by 99% of the population. The independence of the Republic of Armenia was formally declared on September 23, 1991 and a new Constitution was adopted in July 1995. Now that Armenia was independent, it had to start rebuilding its devastated economy. The armed conflict in Nagorno Karabagh since 1988, the energy blockade imposed by Azerbaijan at the end of 1991, and the 1992 war in Abkhazia (which closed the route to Russia through Georgia), were very difficult obstacles to overcome. By 1993, the Armenian government could not find a way to begin solving the social, economic, and political problems. The last remaining oil and gas pipelines through Georgia were blown up by saboteurs. To survive the cold winter, Armenians began cutting down the trees to use them as firewood. 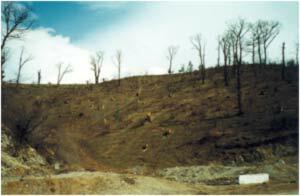 The energy crisis of the 1990s increased the deforestation rate in the country. Illegal wood cutting increased sharply because the people needed fuel to cook, for warmth, and to function economically. The trees provided an excellent source of fuel. Independence movement from the Soviet Union: 1990 and 1991. Armed conflict between Armenia and Azerbaijan: 1991 - 1994. Cease-fire between Armenia and Azerbaijan: May, 1994. Isolated armed conflicts between Armenia and Azerbaijan: 1995 - currently. Source: University of Texas at Austin. Armenia (covering an area of 30,000 square kilometers) is a landlocked country in the southern Caucasus. It is located between the Black Sea and the Caspian Sea. Armenia is bordered on the north by Georgia, on the east by Azerbaijan, on the southwest by the Nakhichevan Autonomous Republic of Azerbaijan, on the south by Iran, and on the west by Turkey. Though geographically in Western Asia, politically and culturally Armenia is closely aligned with Europe. Therefore, Armenia is seen as a transcontinental nation. Armenia is located in the north-east part of the Armenian Highland. The Armenian Highland (covering an area of about 400,000 square kilometers) is part of the Transcaucasian Highland and constitutes the continuation of the Caucasus mountains. It is a mixture of lava plateaus, volcanic cones, fault-fold ranges, and a number of lakes (Lake Sevan, Lake Van, and Lake Urmia) in tectonic depressions. Most of the Armenian Highland is in Turkey, with some part in Iran, Georgia, and Azerbaijan. The highest point of the Armenian Highland is Mount Ararat (5,165 meters). It is located in the far northeast part of Turkey and it dominates the skyline of Yerevan (Armenia's capital). In earlier times, Mount Ararat was located in what is historically and geographically regarded as part of Armenia. However, following the Treaty of Kars in 1923, Turkey and the Soviet Union divided the land and established a new border between Turkey and Armenia, placing Mount Ararat on the Turkish side. The Book of Genesis in the Bible identifies this mountain range as the resting place of Noah's Ark after the Great Flood. "And on the seventeenth day of the seventh month the ark came to rest on the mountains of Ararat". (Genesis 8:4) Mount Ararat is considered as the Armenian national symbol. The government and citizens of Armenia and the government and citizens of Azerbaijan. Armenia's forests are subtropical (61%) and temperate (39%). 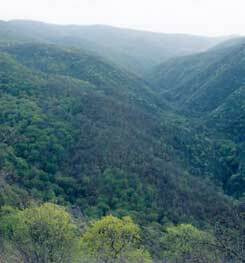 (M) The Armenian forest cover contains 110 tree and 152 shrub species. It is divided into three regions: northeast, southeast, and central. According to the data on table 1, the northeast is the region with the most forest cover in the country (62%) and the central region is hardly covered by forests (2%). Source: "Evolution of the Forest Cover in Armenia". In 1988 Armenia's forests were mostly covered with oak, beech, and hornbeam. These tree species represented 81.3% of the total forest cover. Pine, juniper, and coppice hornbeam covered 10.3% of the forests. The remaining 8.4% of forest cover included ash and elm, among other species. Table 2 shows the hectares and the individual percentages of each type of tree. - Decline in productivity and in regeneration of forests. - Air and water pollution. - Changes in the microclimate and in the composition of species (populations of pest species has increased). - Acceleration of desertification, leading to the abandonment of valuable and once fertile agricultural lands and to the creation of vast wasteland areas. - Increase in erosion, causing floods, landslides, and mudflow (damaging regions like: Tavush, Sunik, and Lori). Table 4 shows that the change in the Armenian forest cover during the 1990-2005 period was almost 19% (approximately 63,000 hectares). Even though the economy has improved at a macroeconomic level, it will take several years for the deforestation and degradation processes to slow down. The Armenian people and the international community must take immediate action to protect the forest cover before it completely disappears. Despite the harshness of winter in most parts, the fertility of the plateau's volcanic soil made Armenia one of the world's earliest sites of agricultural activity. Armenia's multiple agronomic zones are ideal for the cultivation of a wide range of crops and animal products. Its range of elevations and microclimates allow production of several varieties of grapes and tree fruits. The richest farmland is found on the Ararat plain in southwestern Armenia (irrigated by the Arax River) and in the valleys north of Yerevan. Armenia has a highland continental and dry climate, with cold winters and warm summers. Temperatures generally depend upon the elevation. Mountain formations block the moderating climatic influences of the Mediterranean Sea and the Black Sea, creating wide seasonal variations. On the Armenian Plateau, the average midwinter temperature is 0ºC (January is the coldest month) and the average midsummer temperature exceeds 25ºC (July is the warmest month). Average precipitation ranges from 250 millimeters per year in the lower Arax River Valley, to 800 millimeters at the highest altitudes. The heaviest rainfall is in the mountains. Although Armenian culture was largely preserved under the Soviet rule, the boundaries of the Republic set by the Soviet Union were never fully accepted. Nagorno Karabagh was an independent state before 1921. In 1921 the Bureau of Caucasian Affairs declared the region part of Armenia. However, Stalin reversed the order and transferred Nagorno Karabagh to the jurisdiction of the Soviet Republic of Azerbaijan a few days later. Nagorno Karabagh became an autonomous region in 1923. The Armenians objected, since 80% of Nagorno Karabagh's population was Armenian. (EIU) They were also unhappy that Nakhichevan (with a substantial Armenian community) was given the status of an autonomous republic within Azerbaijan. In the 1930s the Turkish-Iranian border was adjusted, giving Turkey a border with Nakhichevan. Once the policies of Perestroika and Glasnost took hold in the 1980s, demonstrations were held in Armenia to demand the incorporation of Nagorno Karabagh. The pressure for reunification was formally reinitiated in 1988, with the establishment on the Karabagh Committee. Moscow responded by sending 5,000 troops into the region and by imposing direct rule over it. The tension increased when ethnic Armenians in the Azerbaijani city of Sumgait were massacred. During the 1995-2003 period there were negotiations between both countries, but they were not able to reach an agreement. The economic and energy blockade continued causing problems in Armenia. In 2004, ten years after the beginning of the cease-fire, the situation between both countries was growing more tense and each side accused the other of violations to the agreement. During the first months of 2006 the foreign ministers of each country met and drafted a short preliminary document that outlined the principles for future action. Maybe this is the first step toward a final-status agreement. The internal dispute during the independence movement from the Soviet Union, which lasted a couple of years (1990 and 1991). The on-going dispute (cease-fire since 1994) between Armenia and its neighbor Azerbaijan over the Nagorno Karabagh region, which started in 1988. The level of conflict started as intrastate and ended as inter-state. The approximate casualty count is equal to 6,160 Armenians and 24,270 Azeris. In every war or armed conflict we find two types of casualties: military and civil (direct and indirect). The conflict between Armenia and Azerbaijan and the conflict between Armenia and the Soviet Union are not the exception. * Calculations based on the available information. 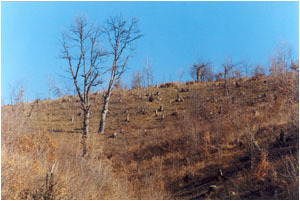 The link between the environmental problem "deforestation" and the conflict lived in Armenia at the beginning of the 1990s (Independence from the Soviet Union), can be classified as an indirect link. The independence movement did not originate because the Armenian forests were being cut, burned, or depleted. Rather, this movement began as a response to the inevitable fact that the preservation of the Soviet Union was no longer feasible. The political, social, and economic reality proved that the Soviet Union was falling apart. The attempt to overthrow the government in August 1991, marked the moment in which Armenians saw the opportunity to separate and gain their independence. The link between the environmental problem "deforestation" and the conflict between Armenia and Azerbaijan over the region of Nagorno Karabagh (1988 - 1994, armed conflict; 1994 - 2006, isolated incidents), can be classified as a direct link. The energy blockade imposed by Azerbaijan led Armenia to an energy crisis during several winters and their only source for heat were the trees. This diagram shows that the two major causes of Armenia's high deforestation rate during the 1990 - 2005 period are: the Armenian independence and the Azeri energy blockade. These two variables have a direct relationship with the deforestation variable. The independence and the blockade caused an energy crisis which, in turn, caused the deforestation. They also affected the Armenian quality of life in a negative way, leading to the deforestation. The direct relationship between the Armenian independence, the energy crisis, and the deforestation problem can be described as follows. The newly independent Republic of Armenia had to organize its political, economic, and social structures. In addition, the country had to solve the problems caused by the energy blockade. Unfortunately, they did not have a lot of time to find solutions. It was the end of September and the bitterly cold winter was upon them. The population turned to the forests to find a way to solve their immediate needs. They cut down the trees and used the wood to cook and to warm themselves. That is why the deforestation rate increased during this period; and why it continues to be a very serious environmental problem. The political part of the dispute with the Soviet Union was resolved on September 23, 1991, when the Armenian legislature declared Armenia's Independence. On the other hand, the military dispute with Azerbaijan was halted on May 12, 1994, when the cease-fire was negotiated. However, the environmental problem of deforestation in far from being resolved. Forests continue to disappear in Armenia at alarming rates. (AP) Armeniapedia - http://www.armeniapedia.org. On-line encyclopedia about Armenia. 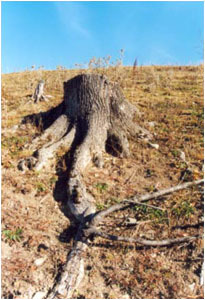 (ATP) Armenia Tree Project - http://www.armeniatree.org. Organization that conducts environmental projects in Armenia's impoverished and deforested zones. Armenian Diaspora - http://www.armeniandiaspora.com. The largest on-line Armenian news portal. (AF) Armenian Forests NGO - http://www.armenianforests.am. Works to protect and restore Armenia's threatened forests, while helping to create jobs and build the economy. Caucasus Environment Outlook - http://www.gridtb.org. Regional report on the status of the environment in the Caucasus. It includes regional and environmental trends from Armenia, Azerbaijan, Georgia, and Russia. Earth Trends - http://www.earthtrends.wri.org. Provides environmental information and data. Institute of War and Peace Reporting - http://www.iwpr.net. Seeks to build peace and democracy through free and fair media in several regions of the world, including the Caucasus. (LN) Lake Net- http://www.worldlakes.org. Global network working for the conservation and sustainable management of lakes. Library of Congress Country Studies - http://lcweb2.loc.gov. Provides facts about a country. (M) Mongabay - http://www.mongabay.com. Seeks to raise interest in the appreciation of wild lands while examining global trends in technology, economics, and finance on conservation and development. (RFE) Radio Free Europe - http://www.rferl.org. Source of news and information from Europe, Russia, Caucasus, and Asia. (AK) Donabédian, Patrick; Lang, David Marshall; Walker J., Christopher; and Mutafian, Claude. Armenia and Karabagh: the Struggle for Unity. Minority Rights Publications, UK, 1991. (IFR) Moreno-Sánchez, Rafael and Sayadyan, Hovik Y. "Evolution of the Forest Cover in Armenia". International Forestry Review, Vol. 7 (2), 2005. (EIU) The Economist Intelligence Unit Country Profile: Armenia. The Economist Intelligence Unit Limited, UK, 1993-1994, 1994-1995, 1995-1996, 1996-1997, 1997-1998, 1998-1999, 1999-2000, 2001, and 2002. I would like to thank Armenian Forests NGO and Armenia Tree Project for providing the photographs. Courtesy of Armenian Forests NGO. Courtesy of Armenia Tree Project.